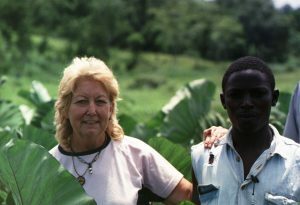 Mother and grandmother and now semi-retired, Ann McCarthy first went to Ruhanga in south-west Uganda in 2005 when she was invited by her safari driver Mr Denis Aheirwe (below, left). He took her to see his compound – the family land given by his father – and immediately saw its potential. It is right on the main road that runs from Kampala to Rwanda and the home of the mountain gorillas, but it was in a rural area where passing visitors had no reason to stop. Denis’s dream was to build a Guest House so tourists would stay awhile and thus he could provide employment for his local village people. He was already employing men to make bricks, as the clay there is very good quality. Some bricks he sold and some he used to begin building his house. 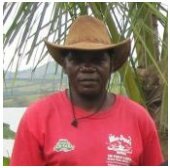 He introduced Ann to his family and friends in the village and she found them all so friendly and welcoming despite their poverty, that she was bowled over – all the rest of her spending money was soon gone in the local hardware shop buying cement, nails and iron sheets. After completing the main rooms in the guest house – now the lounge, the bar and two staff rooms – they concentrated on getting four bedrooms built at the back. This started to generate a small income as it was adequate for local guests, although not of a standard suitable to invite volunteers. They needed to clean the whole place up and build better toilets and washrooms if they wanted to attract Mzungus (white people). She discovered that she could pay local men the equivalent of a pound a day for labouring and they would be queuing up for work, so she they got them filling in the holes left behind from making bricks, levelling out the land and generally getting it looking less like a building site. Soon there were many improvements with four individual African Bandas and a new toilet block nearby, together with a rare electricity supply and TV. By then the guest house was getting some more visitors and then came some volunteers which enabled them to build another two guest rooms at the far end of the compound. This building started out in life as a chicken house but they found it cost more to feed the chickens than the income they received, so it was left it empty for awhile. The local parents then started asking Denis and Ann to start a Nursery School as the primary year does not start until they are seven. After much discussion the chicken house was thoroughly cleaned and painted and, with pictures on the walls, mats on the floor and also a blackboard which put many government schools to shame. Volunteers have taken out crayons and colouring books, pens & pencils, clipboards, plastic bricks, dolls and toy cars, and many small reading books. As with all successful community projects, events started moving briskly. More volunteers started to arrive at Uganda Lodge, which, together with some international fundraising, soon provided funds for the developing complex there today. After working with Denis for over 8 years it is very easy to see that all the money donated from UK charities plus the small profits from the Lodge and safari business goes directly towards these Community Projects and none is lost through expensive or dishonest administration methods. New classrooms have been built providing education for some 400 children together with a headmaster’s office, a school kitchen, a covered dining area, and two brick-built toilet blocks complete with septic tanks. Recently two dormitories have been added to enable the eldest children to board and have extra time for their studies. At the volunteer accommodation there are now over 20 bandas and rooms in the main house and all have hot and cold showers, electric power points and western style flushing toilets nearby. Dining facilities have been extended and a new kitchen built. A water tank was built up in the hills by the source of a stream and this now provides piped water to three villages for the first time with access points near many of the homes. A new medical centre has just been opened for the community to see to the village’s health care needs. and much more is planned for the future. We are hoping that through our supporting UK charities we will be able to build and fully open a Vocational Skills Training Centre where we would have a variety of workshops for the local youth to come and develop skills and thus promote employment opportunities. Currently 85% of young people aged 15-30 are without work in the district and rely entirely on subsistence farming. Already built and about to be opened is a Bicycle Repair workshop plus a Sewing & Tailoring facility. Current proposals for fundraising are geared towards providing sanitation and shower facilities for students, and then a vehicle repair workshop and also a coffee shop for passing motorists to stop for a short break.